On Saturday, the Greensboro Children’s Museum opened a new Edible Schoolyard (the first children’s museum in the country to do so). We have been fans of the GCM since we moved here, and the new garden just added to this treasure. As part of the opening-day festivities, the museum held a 5K fundraiser run. The route took us through downtown Greensboro, through Fisher Park and past the baseball stadium. We ran down Greene street, then a block up Elm, right past Rob’s office. Harper sat back in her stroller and enjoyed the ride, occasionally giving us high-fives and singing “Bye, Bye, Blackbird.” She waved at Guilford the Grasshopper as we went past the stadium, and told me not to throw my water cup on the ground like everyone else did at the water station. As we rounded the corner toward the finish line, Rob took off in a sprint, and beat me by seven seconds. (In my defense, I was pushing the stroller.) We finished 35:01 and 35:08. Neither of us could have done that a few months ago. After the race, we stood around eating bananas and apples. Harper, despite having done nothing but sit for the last 35 minutes, ate more than either of us. Her snack included a granola bar she’d had her eye on before the race. I’d told her she had to wait; when we finally freed her from the stroller straps, she made a beeline for the food table and snagged the last one. But then it was her turn. The Kids’ Dash kicked off at the same start/finish line, and the kids were to run the length of the museum parking lot, turn around, and run back. 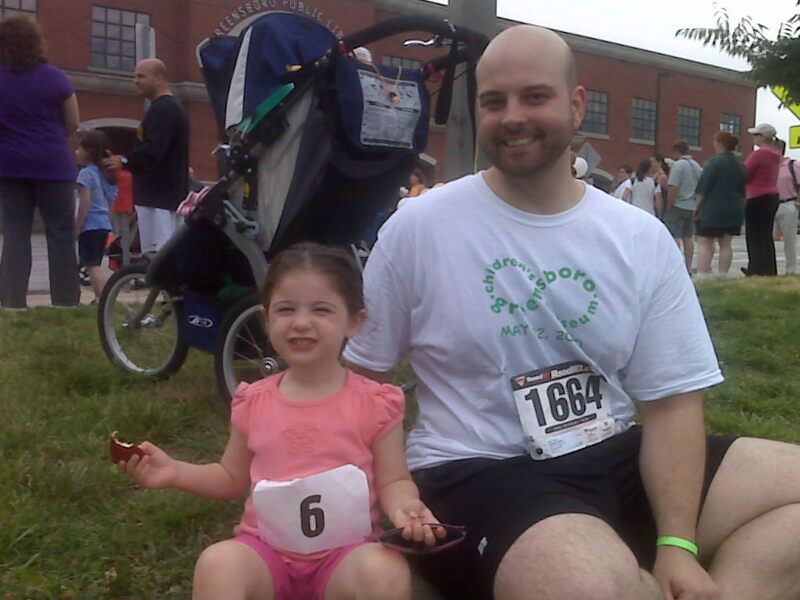 There were kids of all ages, most running on their own, but a few with parents, so we ran together. 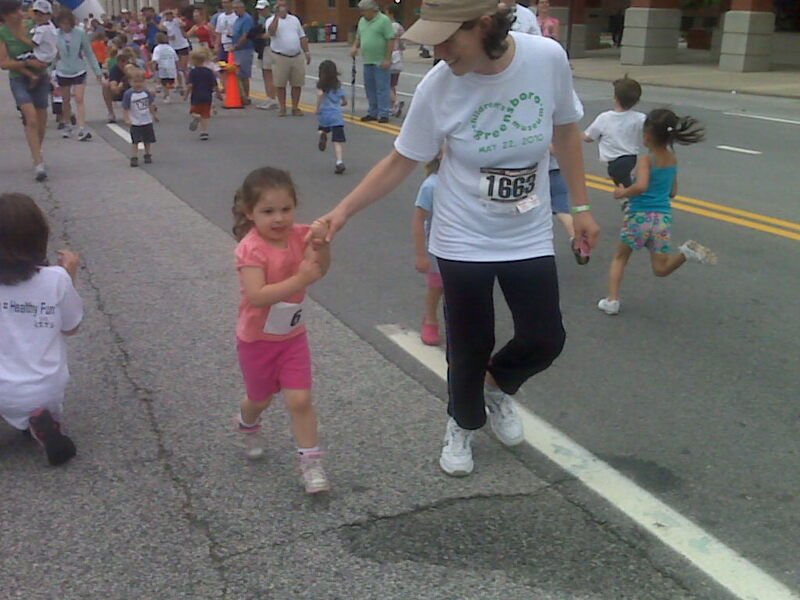 She held my hand until just before the end, when she let go and sprinted by herself across the finish line. She got a medal for finishing the race, and then someone gave her a balloon, and we topped it all off with a blue sno-cone. Then it was time to go into the museum for the garden’s ribbon cutting ceremony. Harper got to play on the airplane and the choo-choo-train while we waited for the festivities to start, and then she and Rob went off to play in the other room while several important people talked about how wonderful the Edible Schoolyard is. Finally, finally, it was time to see the garden. It was worth the wait. There was lettuce to cut and take home, vegetables and flowers of all kinds, a pond with tadpoles, and far more activities than we had energy for. We did stop in the tasting kitchen and sampled some excellent goat cheese, a black-bean dip, and some kind of spicy hummus. Harper had lemonade, and then a cookie, and we managed to get her out before she discovered the fresh strawberries in the back corner. On the way out, we stopped to see two rabbits, tended to by a volunteer who was asking kids what the rabbits should be named. Harper suggested Flibert and Felix. And with that, we called it a day. We got back home just before the afternoon rain started, and just in time for a nap.